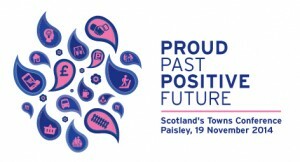 Scotland’s Town Partnership recently announced they are hosting a conference on Wednesday, 19th November 2014 at Paisley Town Hall, Paisley. The gathering for everyone with an interest in Scotland’s towns and high streets, this year’s conference will focus on the future of Scotland’s Towns, building on the untapped heritage and culture of the past, whilst looking to innovation, innovative thinking, and entrepreneurship to deliver towns for the future. The day is a blend of keynotes; short stories from town and city projects large and small; and cafe style space for learning, sharing, exhibiting and networking. Main sessions will focus on the following themes, however, broad ranging topics will be discussed in our café space.